Even though the holiday season can seem to smother us with cookies, their high time never ends in my orbit (it’s cookies all year around here!). For a long time, I’ve wanted to create a bright and buzzy cookie as a nod to my most popular dessert. And with a new year on the horizon, the refreshing duo of gin and lime seemed especially timely and quite appropriately spirited. A scoop of vanilla bean would also fit the bill, balancing the cool citrus tones with a welcome warmth. 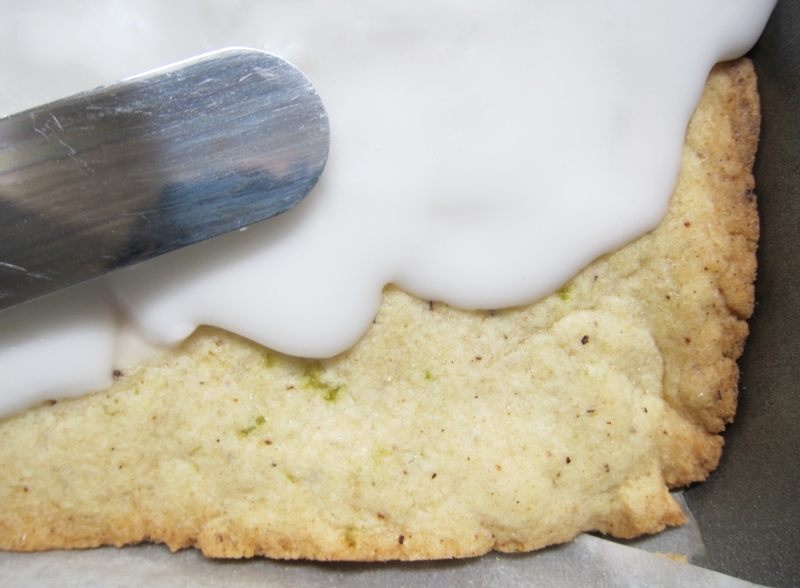 I decided on a buttery bar cookie full of crushed juniper berries (gin’s signature essence), plus plenty of lime zest for a natural match. The sweet, crisp icing would deliver a dose of revered local gin, while the pastry would offer a deliciously delicate, tender crumb — in part thanks to a bit of rice flour. Whether cut into bars or bite-sized morsels, these juniper gin cookies proved to sing of celebration. Preheat oven to 350 F. Lightly grease inner bottom and sides of a 9×13” pan, then line with an oversized sheet of parchment so that it hangs over the two longer sides. Lightly grease the surface of the parchment. Set aside. Wash and dry two limes. Using a fine grater such as a Microplane, lightly zest the limes; set zest aside. Reserve zested limes for icing. Using a blade grinder or mortar and pestle, pulverize the juniper berries until powdered (some small flakes are fine); set aside. In a large bowl, beat butter and sugar until smooth. Add the egg yolks one at a time, incorporating them individually. Mix in the vanilla bean and crushed juniper until dispersed. Sift both flours, baking powder and salt over the bowl. Mix until distributed, adding the zest berries. Knead with hands until dough holds together and zest is well dispersed. Press dough evenly into lined pan, to the edges and reasonably flat. Bake for 20 minutes, until edges are toasty and center does not look wet. Let cool completely to room temperature before making icing. Juice limes (you may not need both); remove any seeds. Place one tablespoon of lime juice in a 1/3 cup measure, then add gin to fill cup. Place in a medium saucepan. Stir in the salt. Measure out the powdered sugar (do not add to saucepan yet) and set nearby. Keep cooled cookie pan nearby, along with a heatproof whisk and an offset spatula. Heat saucepan over a medium flame until mixture is simmering, scalding hot. Turn off heat and quickly add the powdered sugar to the pan. Without delay, vigorously whisk the mixture until smooth, then pour the icing over the cookie slab, rapidly spreading with spatula evenly to edges of pan. Surface of icing will dry quickly. Let pan sit in cool, dry air until icing has hardened completely. Serve in mini cupcake liners and, if desired, decorate with spirals of lime zest. I like to use a citrus zester (not a grater) and pull long strips. If you’d like them to stick to the cookies, reheat some icing and use a dab as glue, or use a tiny drop of corn or golden syrup. Store cookies in sealed containers for up to 5 days. With their soft, speckled dough and cool gin glaze, these cookies pack an abundance of delight. Citrus lovers, gin lovers, and all kinds of cookie lovers will enjoy these vanilla-flecked treats. Their rich yet delicate flavors and crumbly, buttery texture offer a sweet harmony that’s welcome on the tongue and in the belly. Fragrant with citrus and spirits, they are flavorful and fresh: a perfect pick-me-up for a special occasion, an edible gift, or anytime. Cheers! Maybe next time… Instead of strips of lime zest, green or silver sugar sprinkles are a fun and easy decoration — just be sure to scatter them the moment you add the icing since it hardens quickly; they may not stick otherwise. Similarly, a zig zag of tinted icing or melted white chocolate would also be lovely across each cookie. If you don’t need a whole pan’s worth of cookies, shape dough into balls and bake what you need, halving the recipe or freezing extra dough balls. Use a scant tablespoon of dough a piece and bake on parchment lined cookie sheets, checking at 8 minute mark and baking in further 2 minute increments as needed. Dunk cooled cookies in icing or spoon it over each one. This entry was posted in Baking with Booze, Cookies & Bars, Sweets and tagged baking with gin, citrus, cookies, gin, juniper berries, juniper berry, lime. sugar cookies, saint george spirits, St George Spirits, st. gerorge spirits, terroir gin. Bookmark the permalink. These are awesome! I make them all the time. Thank you so, so much for taking the time to tell me, Liz! Those look delicious, and so very moist! Beautiful photographs as always too. Happy New Year’s, Butter Sugar Flowers! May this coming year, 2016, be a wonderful year for you! Can’t wait to see all the new sweet creations you create! Thank you, dear Erica! Looking forward to the beauty you create in 2016, too!